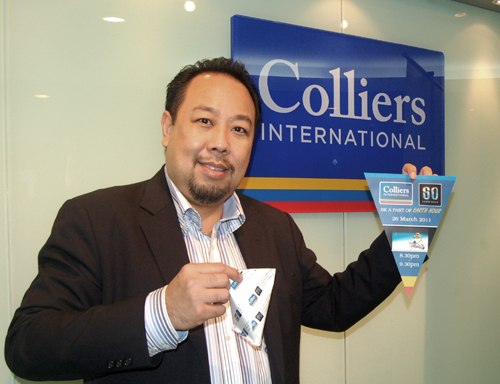 Colliers International Thailand would like to invite everyone to be a part of EARTH HOUR 2011 campaign to help the EARTH. Earth Hour 2011, the annual ‘Lights Out’ event, will take place on Saturday 26 March 2011 at 8:30pm. By turn off the lights for 1+ hour. “We are creating a campaign to public and our clients to be aware and to understand Earth Hour initiatives. We would like to raise awareness about better environment and sustainability living on the public’s perspective. We want everyone to get involved and have the sense of belonging of their own contribution to the earth.” said Patima Jeerapaet, Managing Director of Colliers International Thailand. “We start this campaign since 1st of March 2011 with 3 properties under our management, Deutsche Bank, Assumption University (Suvarnabhumi Campus) for AU Mall, Dormitory, Sport Complex, Car Parking and The Tepp Serviced Apartment and we are promoting this campaign with our clients during this period” he added. This entry was posted on March 18, 2011 at 9:26 am and is filed under Uncategorized. You can follow any responses to this entry through the RSS 2.0 feed. You can leave a response, or trackback from your own site.